Although there are distinct types of abuse defined, it is not uncommon for an elder to experience more than one type of mistreatment at the same or different times. For example, a person financially exploiting an elder may also be neglecting to provide appropriate care, food, medication, etc. Visit Administration for Community Living for additional information. In case of emergency, call your local police station or 911. Call the local police or sheriff's department or 911 if someone is at risk for immediate physical harm. If you suspect a crime was committed, contact the local police or sheriff's department. For abuse or neglect in a long-term care facility (e.g., nursing home, assisted living facility), contact Long-Term Care Ombudsman. Eldercare Locator and National Center on Elder Abuse created a "Protect Your Pocketbook: Tips to Avoid Financial Exploitation" brochure for campaign to prevent financial abuse of older adults. "Home for the Holidays" What to look for during your annual visit to elderly relatives PDF by Mary Twomey, MSW. Print the "Home for the Holidays" flyer to hang up or hand out, and bring awareness to the signs of elder abuse. You are welcome to download these PDF files to print and distribute these posters. We've gathered tools and resources that we think would be helpful to many people in their work addressing elder abuse and neglect. Presented of Feb. 21, 2013 by the Center of Excellence on Elder Abuse & Neglect and made possible by a grant from the Archstone Foundation. This publication offers an overview of the law, issues and practical concerns of elder financial abuse from both a civil and criminal perspective. Civil Elder Financial Abuse for Prosecutors/Criminal Elder Financial Abuse for Civil Lawyers (pdf) downloadable booklet was produced by Institute on Aging with material contributed by Helen Karr, Esq. and Steve Riess, Esq. Sonoma County’s Elder and Dependent Adult MDT has been in existence in its current form for over ten years, and in that time many new collaborative ideas and practices have been developed. This report provides recommendations to improve the Sonoma County MDT, and thus improve services for our clients. Research for this report includes information gathered from current publications, observations of other California county MDTs, a survey of local Sonoma County agencies, and interviews with key informants. Not only do residents in unlicensed facilities not have access to regulations that have been designed to preserve their rights in licensed facilities, they are also more susceptible to abuse and neglect. This fact sheet and screening tool allows for quick identification of unlicensed care facilities, and referral information to those agencies that handle complaints in these settings. The tool is designed for and has been distributed to many organizations and agencies including but not limited to: IHSS workers, APS, ombudsmen, fire fighters, police officers, building and safety staff, regional planning, regional centers, hospital social workers, and department of mental health patients’ rights advocates. Thank you to Molly Davies, MSW for permission to share these resources! Fighting scams at senior centers takes a multidisciplinary team effort that is comprehensive instead of piecemeal. Our project develops a county-wide awareness campaign about financial exploitation occurring in senior centers and a step-by-step plan that cities can use to protect seniors from harm. A coalition of senior center directors, the District Attorney’s Office, local legal services agencies, city policy planners, private bar, senior advisory boards, and real estate and life insurance professionals works together to accomplish our goals. Thank you to Shawna Reeves, MSW for permission to share these resources! This UCLA School of Dentistry project focuses on developing a screening tool and reporting protocol for pre-doctoral dental students to use while working in the dental clinic. The screening tool, tailored for use in a dental teaching clinic, is also appropriate for use in private practice. Given that dentists are mandated reporters, there is a strong reason to adopt this screening tool and protocol in dental teaching clinics throughout California. Thank you to Melanie Gironda, Ph.D. for permission to share these resources! Typically, an elder abuse case requires weeks to months of phone calls among agencies with very distinct, and at times conflicting, perspectives and goals. Recognizing disconnections between the many disciplines that address elder abuse, the University of California, Irvine School of Medicine, Program in Geriatrics and agencies from social services and the criminal justice system piloted a groundbreaking approach to this problem: the nation’s first Elder Abuse Forensic Center (EAFC) in 2003. EAFC members meet regularly to determine concrete actions that can be taken on behalf of the client agency (e.g., Adult Protective Services, Long-Term-Care Ombudsman, Law Enforcement) to address the needs of a specific case. Members use their expertise and agency resources to provide direct help with the case. Since the Orange County Elder Abuse Forensic Center was established, we have been approached by other communities interested in starting their own Elder Abuse Forensic Centers and assisted in the creation of two new EAFCs. Based on these experiences, we created a Manual and 20-minute companion DVD to describe how an Elder Abuse Forensic Center (EAFC) works and to help agencies develop a preliminary structure to create an EAFC in their own communities. 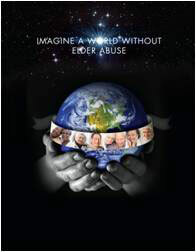 Elder abuse course created by Karran A. Phillips MD, of Johns Hopkins Internet Learning Center, can be accessed by visiting the website, www.hopkinsilc.org. Register as a new user for the Internal Medicine curriculum as a member of the Demonstration Group. Log on and complete the Elder Abuse module. Why the nation’s toughest elder abuse laws make some California physicians nervous ACP-ASIM Observer. Dr. Laura Mosqueda partnered with QuantiaMD to create a 9-minute training video called, "Red Flags of Elder Abuse: Hx and Interview." A free membership is required to participate. The Health Education Assets Library (HEAL) is a digital library of multimedia teaching resources for the health sciences. HEAL is a component of the National Sciences Digital Library. BITS Fraud Protection Toolkit (BITS Financial Services Roundtable 2010). For ideas and materials to help raise public awareness, visit our Public Awareness page.